Now before I start writing up some crap about Vizhinjam, I've an honest confession: I have as good knowledge about seaports, harbours and their technicalities as a fisherman would have about software.. But that doesn't dampen my enthusiasm to find out more about why this place 'Vizhinjam' , 16km southwest of Trivandrum would rewrite the horoscope of Kerala Capital, and who knows , the whole nation as a fact. You would've nudged into very few optimistic souls even in Trivandrum if you spoke about 'Vizhinjam', a few years back...At a time when Vizhinjam featured only on election manifestos once every 5 years and appeared as single column news somewhere inside regional newspapers. But how things have changed, and quick!! 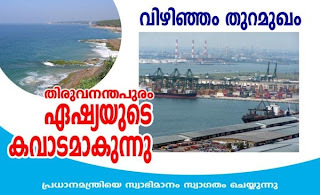 Vizhinjam International Container Transshipment Terminal(VICTT) or simply the Vizhinjam Seaport (as we will call here) has grown up from a regional patriotic's dream to a megaproject enticing the attention of the nation. The project worth 8000crore INR is all set to become a reality with the Hyderabad based Lanco Infrastructures awarded the contract to own the pie. Indian ports didn't have enough draft to sustain big vessel loads. So Vizhinjam would be sharing its job with JNPT, Mumbai(the other major container terminal in India) and Vallarpadam, Cochin, but will be possessing some serious advantages over both in terms of handling capacity, depth of water both in the channel and at berth and low Operational & Maintenance costs r/t dredging. The plan is to reclaim nearly 600 acres from the sea to build the breakwater and the necessary port facilities. So that erases the need for population displacement, a thorn in many project plans. Connectivity isn't going to be a big headache as well. The NH 47 Bypass passes just 2km from the project site, and a flyover is planned from Mukkola Jn, Kovalam to Vizhinjam site. A rail link to Balaramapuram, 8 km away on the Trivandrum-Kanyakumari broadguage line is also envisaged. So numbers aside, if Vizhinjam possessed all these potential then why the heck did it take 60 odd years to draw attention to itself?? Vizhinjam dream dates back to pre-democracy era. The erstwhile Travancore Royals nourished plans to build a 6 km channel (something like Seuz channel perhaps) connecting the Arabian Sea to Vellayani lake, thereby turning their kingdom into a port city. Unfortunately, the advent of democracy and the resulting shift of loyalty sealed the fate of this vision. For over 50 years the port project remained in paper, thanks to the lack of interest of regional politicians and active lobbying of adjacent ports in & outside the state. variety of reasons. The powerful business houses of Central Kerala, which relies on the growth of Cochin Harbour feared a plunge if Vizhinjam materialized. The neighbouring state of Tamil Nadu sprung up plans to develop a harbour on the same lines just a few nautical miles south of Vizhinjam, at Kolachel. With a mangle-like grip at the Centre, and with the Ministry of Shipping in its pocket, the Tamil Ealam ministers projected a constant threat for the project. Worse was the local resistance against it, with the Port project apparently threatening to shake the foundations of the thriving tourism and fishing industries in Kovalam. And to crown it all, the lackluster attitude of the leaders, media and public towards the project made it a non-starter. special hug, for fighting a lone battle against all odds to keep this project alive. An old Communist arrogant from Kannur, Mr. M.V. Raghavan. It was heartening to see MVR toiling for Vizhinjam with his mearge resources, when other Trivandrum born politicians were sleeping on top of it. His works were followed up by Mr. M. Vijayakumar, who presently hold the Ports & Harbour portfolio. The toughest job, however, was done by a group of enthusiasts named Trivandrum Development Front(TDF) , Janapaksham and co. They did the groundbreaking job of optimizing public knowledge about Vizhinjam, and gathering local support, absolutely essential for any project of such magnitude and character in Kerala. The media, at last got involved in the project, and guess what; in a positive way!!(Whew...) Accolades to Kerala Kaumudi in particular and Asianet, who created an aura around the project. Vizhinjam has featured on National and Int'l media and now its upto the GoK to make sure the sleeping giant remains awake...and goes to work. The Govt has been careful in evaluating the bids submitted by the International Consortium as it would be unpardonable to allow history to repeat itself. In the 90s the tender was awarded purposely to a clueless and unlisted Kumar Group just to sabotage the project. Last time when everything came through, the Chinese partners of the successful Zoom Builders happened to be the hoodoo. A few reservations raised about the project would be the agonizingly poor industrial background of Trivandrum. SEZ's and manufacturing based industries need to flourish in and around Trivandrum. Even in Cochin, 90% 0f the goods handled are petroleum products to and from the refinery. 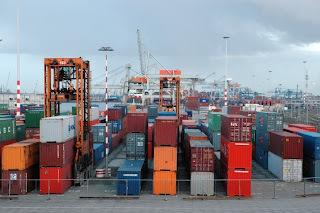 The cost of transferring empty containers back to the base port will be same as that of shipping them here, and so competition would become tough for Vizhinjam in spite of all the God-given blessings. 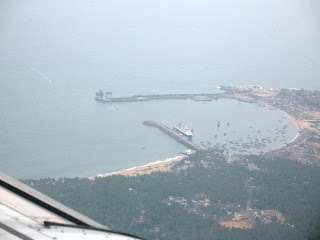 What Vizhinjam must take into its head is that there is a big difference between a Harbour and a Port...Some of the finest harbours in the world seldom see a ship, whereas the busiest Ports are the ones associated with great industrial cities..So Vizhinjam will have some homework and backing up to do! Again as a fair point, Tirunelveli SEZ is just at the backyard of our Ghats and Trivandrum has always been a sister city for them. And the proposed shipbuilding yard on the West Coast of India, if commissioned in Poovar, would be a shot in the arm as well. It remains to be seen as to how the beach & backwater tourism would react to a shouldering Commercial harbour. 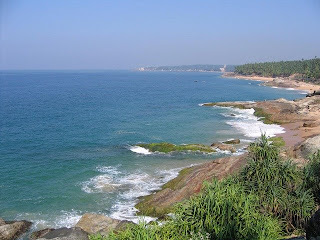 Kovalam is well known globally, so lets hope the charm prevails.. There has been a few concerns for the resorts as their sea-view would be eclipsed by the port. Oil spillage and pollution associated with hulk-vessels may rob Kovalam of its blue pristine waters. Vizhinjam bids have been awarded to Hyderabad-based Lanco Infratech Limited's consortium with Pembinan Radzai Sdn Bhd (PRSB), Malaysia. Nearly 2400 crores will be pumped in for the first phase which would be ready for action by 2013. The remaining 3 phases would be completed in a phased manner, rocketing the investment to over 8000 crores, making it the single largest infrastructure project in Kerala. Look, my dreams have started to take wings as well!